Narcotic agents are potent analgesics which are effective for the relief of severe pain. Analgesics are selective central nervous system depressants used to relieve pain. The term analgesic means "without pain". Even in therapeutic doses, narcotic analgesics can cause respiratory depression, nausea, and drowsiness. Long term administration produces tolerance, psychic, and physical dependence called addiction. 1) Morphine and codeine - natural alkaloids of opium. 2) Synthetic derivatives of morphine such as heroin. 3) Synthetic agents which resemble the morphine structure. 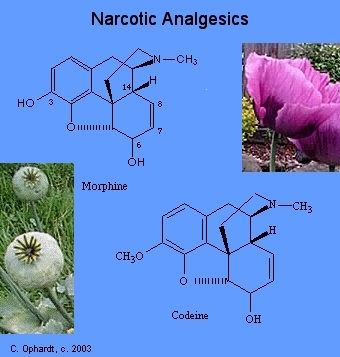 4) Narcotic antagonists which are used as antidotes for overdoses of narcotic analgesics. The main pharmacological action of analgesics is on the cerebrum and medulla of the central nervous system. Another effect is on the smooth muscle and glandular secretions of the respiratory and gastro-intestinal tract. The precise mechanism of action is unknown although the narcotics appear to interact with specific receptor sites to interfere with pain impulses. A schematic for an analgesic receptor site may look as shown in the graphic on the left with morphine. Three areas are needed: a flat areas to accommodate a flat nonpolar aromatic ring, a cavity to accept another series of rings perpendicular, and an anionic site for polar interaction of the amine group. Recently investigators have discovered two compounds in the brain called enkephalins which resemble morphine in structure. Each one is a peptide composed of 5 amino acids and differ only in the last amino acid. The peptide sequences are: tyr-gly-gly-phe-leu and tyr-gly-gly-phe-met. Molecular models show that the structures of the enkephalins has some similarities with morphine. The main feature in common appears to be the aromatic ring with the -OH group attached (tyr). Methadone and other similar analgesics have 2 aromatic rings which would be similar to the enkephalins (tyr and phe). Analgesics may relieve pain by preventing the release of acetylcholine. Enkephalin molecules are released from a nerve cell and bind to analgesic receptor sites on the nerve cell sending the impulse. The binding of enkephalin or morphine-like drugs changes the shape of the nerve sending the impulse in such a fashion as to prevent the cell from releasing acetylcholine. As a result, the pain impulse cannot be transmitted and the brain does not preceive pain. Morphine exerts a narcotic action manifested by analgesia, drowsiness, changes in mood, and mental clouding. The major medical action of morphine sought in the CNS is analgesia. Opiates suppress the "cough center" which is also located in the brainstem, the medulla. Such an action is thought to underlie the use of opiate narcotics as cough suppressants. Codeine appears to be particularly effective in this action and is widely used for this purpose. Narcotic analgesics cause an addictive physical dependence. If the drug is discontinued, withdrawal symptoms are experienced. Although the reasons for addiction and withdrawal symptoms are not completely known, recent experiments have provided some information. A nucleotide known as cyclicadenosine monophosphate (cAMP) is synthesized with the aid of the enzyme adenylate cyclase. Enkephalin and morphine-like drugs inhibit this enzyme and thus decrease the amount of cAMP in the cells. In order to compensate for the decreased cAMP, the cells synthesize more enzyme in an attempt to produce more cAMP. Since more enzyme has been produced, more morphine is required as an inhibitor to keep the cAMP at a low level. This cycle repeats itself causing an increase in the tolerance level and increasing the amounts of morphine required. If morphine is suddenly withheld, withdrawal symptoms are probably caused by a high concentration of cAMP since the synthesizing enzyme, adenylate cyclase, is no longer being inhibited. 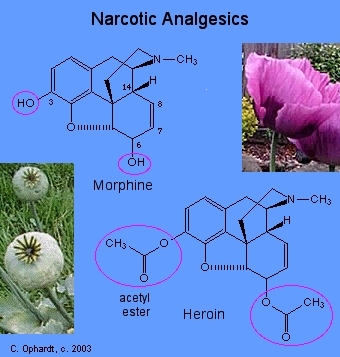 Morphine and codeine are contained in opium from the poppy (Papaver Somniterum) plant found in Turkey, Mexico, Southeast Asia, China, and India. This plant is 3-4 feet tall with 5-8 egg shaped capsules on top. Ten days after the poppy blooms in June, incisions are made in the capsules permitting a milky fluid to ooze out. The following day the gummy mass (now brown) is carefully scraped off and pressed into cakes of raw opium to dry. Opium contains over 20 compounds but only morphine (10%) and codeine (0.5%) are of any importance. Morphine is extracted from the opium and isolated in a relatively pure form. Since codeine is in such low concentration, it is synthesized from morphine by an ether-type methylation of an alcohol group. Codeine has only a fraction of the potency compared to morphine. It is used with aspirin and as a cough suppressant. Heroin is synthesized from morphine by a relatively simple esterification reaction of two alcohol (phenol) groups with acetic anhydride (equivalent to acetic acid). Heroin is much more potent than morphine but without the respiratory depression effect. A possible reason may be that heroin passes the blood-brain barrier much more rapidly than morphine. Once in the brain, the heroin is hydrolyzed to morphine which is responsible for its activity. Meperidine is the most common subsitute for morphine. It exerts several pharmacological effects: analgesic, local anesthetic, and mild antihistamine. This multiple activity may be explained by its structural resemblance to morphine, atropine, and histamine. Methadone is more active and more toxic than morphine. It can be used for the relief of may types of pain. In addition it is used as a narcotic substitute in addiction treatment because it prevents morphine abstinence syndrome. Methadone was synthesized by German chemists during Wold War II when the United States and our allies cut off their opium supply. And it is difficult to fight a war without analgesics so the Germans went to work and synthesized a number of medications in use today, including demerol and darvon which is structurally simular to methadone. And before we go further lets clear up another myth. Methadone, or dolophine was not named after Adolf Hitler. The "dol" in dolophine comes from the latin root "dolor." The female name Dolores is derived from it and the term dol is used in pain research to measure pain e.g., one dol is 1 unit of pain. Even methadone, which looks strikingly different from other opioid agonists, has steric forces which produce a configuration that closely resembles that of other opiates. See the graphic on the left and the top graphic on this page. In other words, steric forces bend the molecule of methadone into the correct configuration to fit into the opiate receptor. When you take methadone it first must be metabolized in the liver to a product that your body can use. Excess methadone is also stored in the liver and blood stream and this is how methadone works its 'time release trick' and last for 24 hours or more. Once in the blood stream metabolized methadone is slowly passed to the brain when it is needed to fill opiate receptors. Methadone is the effective treatment for heroin addiction. It works to smooth the ups and down of heroin craving and allows the person to function nomrally. "Buprenorphine, an analgesic originally used IV for pre/post surgical analgesia and related, was approved not many years ago for opiate addiction treatment (brand names Subutex and, with naxolone added to help reduce IV abuse, Suboxone. It is provided as a sublingual tablet, available a many, but not all, pharmacies. As a practical matter, a big advantage over methadone is that it can be prescribed within a physician’s office setting, not a “methadone clinic.” The prescribing physician has to be certified to prescribe it, is issued a separate (2nd) DEA number, and is limited in the number of patients that may be seen for this treatment. Another advantage is that it does not have the abuse potential of methadone; it merely fills the opiate receptors to eliminate physical cravings. Onset of withdrawal from buprenorphine is slow, and the symptoms of withdrawal are generally milder, when compared with withdrawal from true opiates. It has been used in prison settings to effectuate a fairly painless withdrawal process in as little as 5 days, although in a typical setting the patient will be weaned off buprenorphine over a period of 4-8 weeks, and occasionally will continue on a maintenance dose." Narcotic Antagonists prevent or abolish excessive respiratory depression caused by the administration of morphine or related compounds. They act by competing for the same analgesic receptor sites. They are structurally related to morphine with the exception of the group attached to nitrogen. Nalorphine precipitates withdrawal symptoms and produces behavioral disturbances in addition to the antogonism action. Naloxane is a pure antagonist with no morphine like effects. It blocks the euphoric effect of heroin when given before heroin. Naltrexone became clinically available in 1985 as a new narcotic antagonist. Its actions resemble those of naloxone, but naltrexone is well is well absorbed orally and is long acting, necessitating only a dose of 50 to 100 mg. Therefore, it is useful in narcotic treatment programs where it is desired to maintain an individual on chronic therapy with a narcotic antagonist. In individuals taking naltrexone, subsequent injection of an opiate will produce little or no effect. Naltrexone appears to be particularly effective for the treatment of narcotic dependence in addicts who have more to gain by being drug-free rather than drug dependant.